Japan has always been prone to earthquakes and tsunamis. As you know, I favor ukiyo-e, Japanese woodblock print art, a great deal. 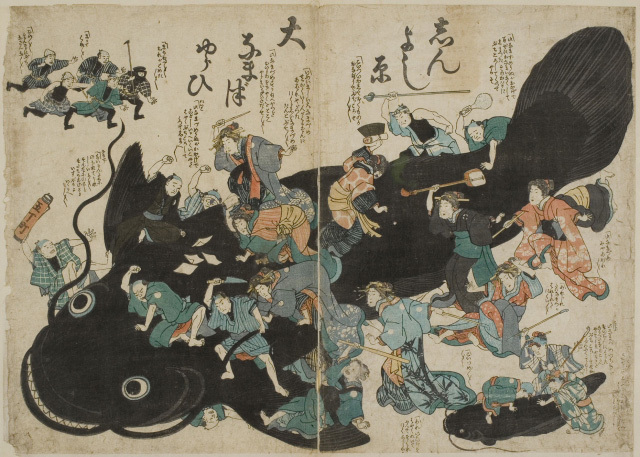 Fascinatingly, the mythological creature causing earthquakes is a giant catfish. Pink Tentacle kindly linked to several woodblock print scans. Here is a small selection. In November 1855, the Great Ansei Earthquake struck the city of Edo (now Tokyo), claiming 7,000 lives and inflicting widespread damage. 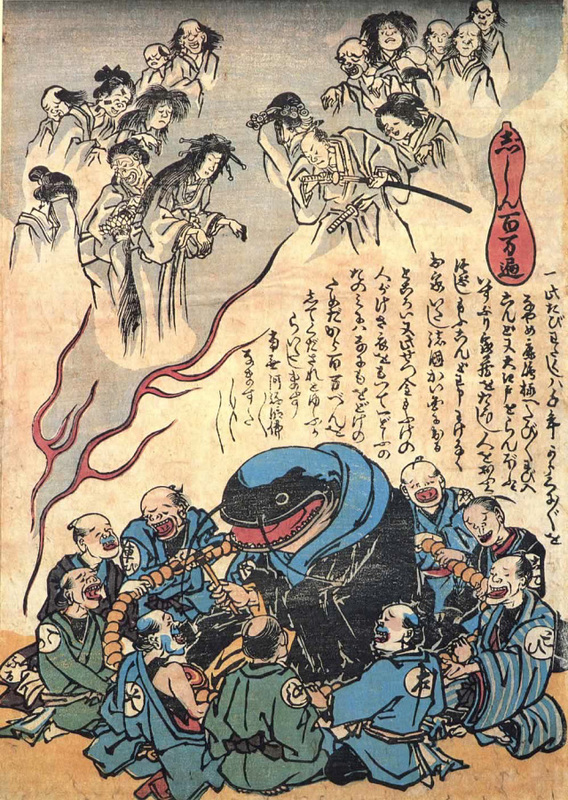 Within days, a new type of color woodblock print known as namazu-e (lit. “catfish pictures”) became popular among the residents of the shaken city. 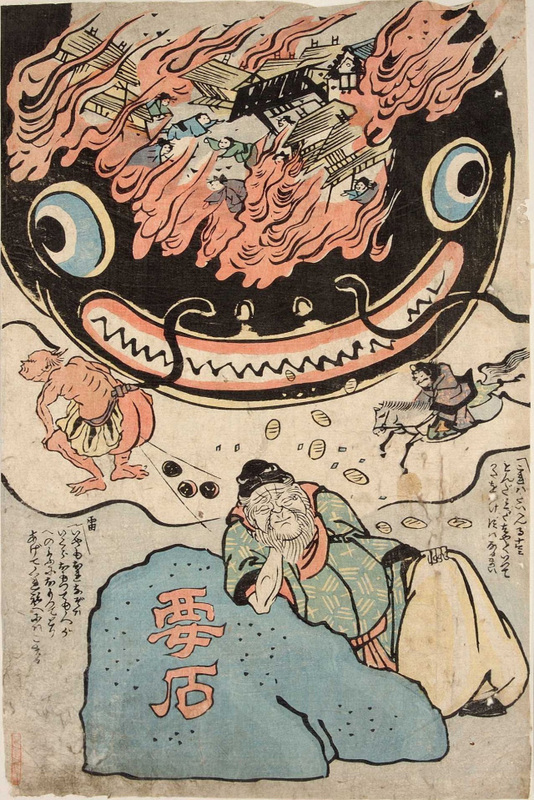 These prints featured depictions of mythical giant catfish (namazu) who, according to popular legend, caused earthquakes by thrashing about in their underground lairs. In addition to providing humor and social commentary, many prints claimed to offer protection from future earthquakes. This print depicts a namazu as a priest seated inside a giant rosary. The creature does not want to cause any more earthquakes, but the “worshipers” — tradesmen such as lumber dealers and carpenters who profit from the disaster — are praying for it to act up again. The ghosts of earthquake victims float overhead. Intense. Let us hope Kashima will restrain the namazu with kaname-ishi for a long time to come. You can view more prints at the Disaster Prevention Museum’s site or at Pink Tentacle.